Every person has a subconsciously hidden fear of something. We all know about the fear of water, spiders, or clowns. However, only a few of us are aware of the fears that are buried deep in our subconsciousness. 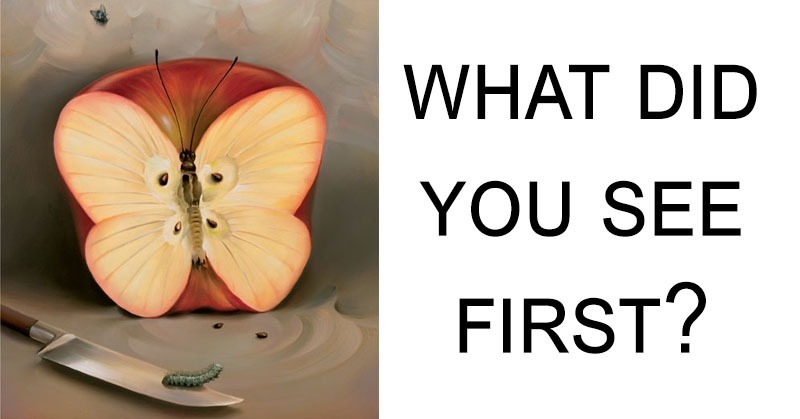 Take a look at the painting above by Vladimir Kush, and remember which thing you noticed first. Then, you can continue reading this article to find out the detailed analysis of your choice. If the first thing you notice was the knife, then your hidden fear is a deadly disease. You think that you are ill of some severe fatal illness about which you still do not know. So, your fear is that you are going to die unexpectedly. If you saw the caterpillar first, your hidden fear is a ghost (phasmophobia). You are scared that you may experience seeing a ghost or some evil spirits. Also, you are afraid that you may be haunted by the ghosts and spirits at you most vulnerable times such as sleeping or when you are confused. Seeing the butterfly first means that your hidden fear is a betrayal. There is a possibility that in your past you have been betrayed, and now you are afraid that the thing is going to repeat. It may be a rejection from a partner, job, even a dream. But, you are able to hide your fear. It is only visible when you need to face it. If the first thing you saw was the apple, then your biggest fear is death. Anyway, it is not your death, but the death of close family member or friends. You may even have lost someone who was special to you. So, the stress you have experience makes you feel anxious about losing more people. All of the hidden fears have the guild and panic as a common thing. Why these things? For instance, if you have lost your job, and your family depended on you financially, it is normal to feel guilt. Also, if you are not able to find a solution, it is normal to panic. So, this combination of guilt and panic is very negative. After all, we need to learn how to deal and overcome our fears. We should not let the fears control our lives.